How would recommend getting a random sample from a table in SQL? Thank you! This is a good question. Unfortunately, there is not a good answer, because the concept of a random sample does not really exist in relational algebra (which SQL -- to a greater or lesser extent -- is based on). There are, however, ways of to arrive at the solution. This discussion is based partly on the Appendix in Data Analysis Using SQL and Excel. The function rand() does actually exist in many databases, such as IBM UDB, Microsoft SQL, and Mysql. Does this really work for these databases? That depends on whether rand() is a deterministic or non-deterministic function. A deterministic function is essentially evaluated once, when the query is parsed. If this is the case, then all rows would have the same value, and the query would not return a 10% random sample. It would return either 0 rows or all of them. Fortunately, for these databases, the designers were smart and rand() is non-deterministic, so the above code works as written. Another approach in Oracle is to use a pseudo-random number generator and ROWNUM. This approach works in any database that has something similar to ROWNUM. If you happen to be using SAS proc SQL, then you can do something similar to the first example. The only difference is that the function is RAND('UNIFORM') rather than just RAND(). This post (and the next) are about creating accurate Venn diagrams using Excel charts. If you are interested in this, you may be interested in my book Data Analysis Using SQL and Excel. 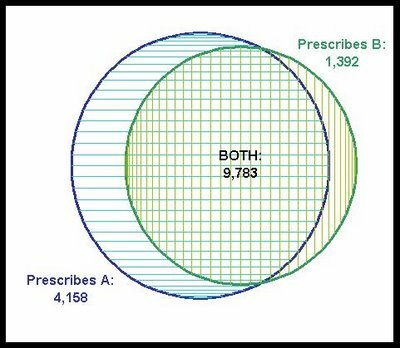 This chart is an example of a Venn diagram. Unfortunately, Excel does not have a built-in Venn diagram creator. And, if you do a google search, you will get many examples, where the circles are placed manually. Perhaps it is my background in data analysis, but I often prefer accuracy to laziness. So, I developed a method to create simple but accurate Venn diagrams in Excel. Creating such diagrams is, fundamentally, rather simple. However, there is some math involved. 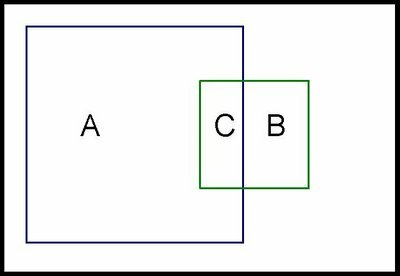 To simplify the math, this post first describes how to create a Venn diagram where the two shapes are squares. In the next post, I'll extend the ideas to using circles. Calculating the correct overlap of the shapes. This post discusses each of these. Notice that the first point is repeated twice. Otherwise, there would be four points, but only three sides. A small challenge in doing this is making the chart look like a square instead of a rectangle. Unfortunately, Excel does not make it easy to adjust the size of a chart, say by right clicking and just entering the width and height. One way to make the chart square is to place it in a single cell and then adjust the row height and column height to be equal. My prefered method is just to eye-ball it. The above chart has a width of six columns and a height of 21 rows. In this case, the square is centered on the origin. There is a reason for this. The temptation is to have the square be positioned at the origin and then pass through the points (0,9), (9,9), and (9,0). However, I find that when Excel draws the square, the axes interfere with the sides of the square, so some are shaded heavier than others. This happens even when I remove the axes. As an aside here, you can imagine creating many different types of shapes in Excel besides squares. However, Excel only understands these as lines connecting a scatter plot. In particular, this means that you cannot color the interior of the shape. 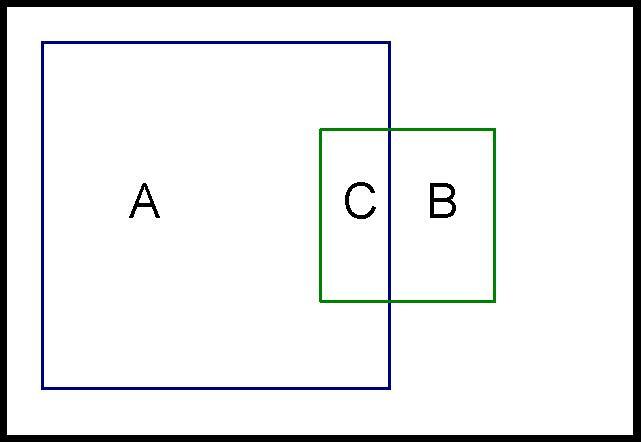 Assume that we have two squares that overlap, one square has an area of 100 (side is 10) and the other 25 (side is 5). What is the overlap between them? There is not enough information to answer this question. It is clearly between 0 (if the squares do not overlap) and 25 (the size of the smaller square). If the overlap is 10, how big is the overlap? In the following picture, the area of C is 10. What are the dimensions of C? The height is the height of the smaller square -- 5. So the width must be 2 (=10/5). The sizes of the two squares. Consider the original diagram at the top of this posting. The sizes of the two regions are 13,941 and 11,175 respectively. The overlap is 9,783. 118.07 for the first square (=sqrt(13,941)). 105.71 for the second (=sqrt(11,175)). 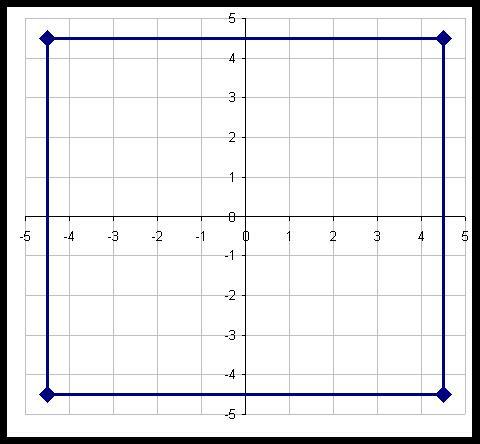 Since we know the side lengths of the two squares, I only need to calculate the offset values. 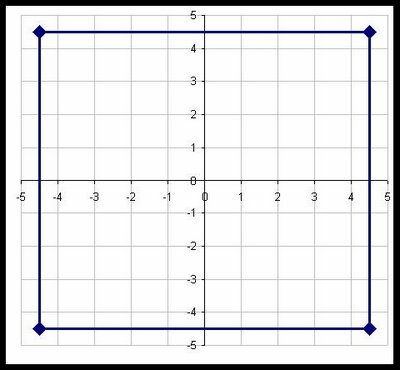 The first square is centered at the origin (rather than starting there), so the offset is - side/2 for both X and Y. The points are listed under "big square" and "little square". The first column is the X value for the big square, the second is the Y value; the third is the X value for the little square and the fourth is the Y value. After creating the chart, you need to beautify it. I remove the axes and axis' labels, thicken the lines around the squares, and adjust the height and width to make the shape look like a square. The attached .xls file (venn-20081025.xls) contains all the examples in this post. The next post extends these ideas to creating Venn diagrams with circles, which are the more typical shape for them. It also shows one way to put some color in the shapes to highlight the different regions. The subject of correlated subqueries arose recently in a data mining class I was teaching. A student inquired about improving the performance of a particular query, which happened to have a correlated subquery. This posting discusses unrolling correlated subqueries to improve performance as well as the rarer need to use correlated subqueries to increase performance. Correlated subqueries are SQL queries that contain a nested subquery, where the nested query refers to one or more outside tables. The definition sounds complicated, but an example is worth a thousand words. My book Data Analysis Using SQL and Excel includes a database of customers, orders, and transactions (which can be downloaded). From such data, we might ask a question such as "What products did customer X order on her or his earliest order date?" A typical way to answer this is with a corrrelated subquery. Since this is standard SQL, all reasonable relational databases should support this syntax. One syntax note: the subquery could optionally contain a "GROUP BY o2.CustomerID" clause. What is the query doing? It is joining two tables together (orders and orderline) and then restricting the results to a single customer. However, the query is about the products in a particular order, so the WHERE clause selects the particular order -- as the one with the smallest OrderDate. Voila. The query answers the question. The correlated subquery is in the WHERE clause, buried in the subquery in the line o.OrderID = o2.OrderID. This is placing a restriction on the values in the subquery based on the results of an outer query. Do note that if the WHERE clause were instead o.CustomerID = , then the subquery would not be correlated, since there would be no connection to the outer tables. So far so good. When we think of how the query runs, we think of iterating through every row in the o2 table and looking to match it to the current value in the o table. If there is an index, so much the better because the query engine can use the index to access the o2 table. This conceptual approach is, in fact, how most (if not all) query engines optimize such a query. For now, I'm leaving open the question of whether this is a good thing, in order to present the idea of unrolling the subquery. This version of the query unrolls the subquery, by creating a summary table with the earliest order date for all customers. The link to the other table is made through an explicit join condition between this summary table and the orders table. Note that in this particular query, the WHERE clause that chooses the customer could be in the subquery, because the columns in the WHERE clause are in the subquery. However, in the general case, the filter could be using columns not available in the subquery -- such as getting all products that start with the letter "A". There is a big difference in how this query gets executed versus the earlier version. The big difference is that now the orders need to be grouped to find the earliest order date for all orders. The correlated subquery could use an index and only look at the handful of rows for a given customer. So, the correlated subquery seems to be more efficient. If the correlated subquery is more efficient, then why do I personally avoid using them? One reason is the explicitness of the joins. I find it much easier to understand the unrolled version. However, ease of understanding is less important than performance. In many cases, the unrolled version does execute faster. Notice that both these queries are looking for data about one particular customer -- a small subset of the overall data. For queries that are looking for such needles in the haystack, then correlated subqueries are fine. However, decision support queries are usually looking to sift through the whole haystack and not look for just the needle. If we changed the question to "What products are ordered on the earliest order date?" then the queries lose the restrictive clause limiting them to one customer. Now what happens? In the case of the correlated subquery, query engines essentially execute the joins in one of two ways: (1) by repeatedly looping through one table (typically the one in the inner join) or (2) using indexes. In terms of join algorithms, these are nested loop joins and index-based joins -- two perfectly good join algorithms. But, I might add, two out of many algorithms that could be used. On the other hand, doing the explicit join as in the second example allows the query engine to execute the different steps it needs to execute, and then to decide on the best strategies. In particular, when the data is partitioned for simultaneous access on multiple processors, most query engines would forget the parallel possibilities and simply execute the correlated subquery on a single processor. On the other hand, most parallel query engines would correctly parallelize the second version of the query. The GROUP BY would execute in parallel, as would the rest of the joins. The query optimizer would use table statistics to generate the best query plan. Correlated subqueries are a tool used when designing queries. In all cases, though, the subqueries can be unrolled using more traditional aggregation and join operations. However, query optimizers generally do not perform this operation. Correlated subqueries are often the most efficient approach when looking for a few rows from a table, particularly when the optimizer can use indexes for the join. On the other hand, unrolling the subqueries is often more efficient when there is a large amount of data, because the optimizer can do full query optimization, making use of parallelism and table statistics. Currently, most query optimizers do not know how to unrolls correlated subqueries -- or how to roll them back up. So, we need to make such decisions when writing the queries ourselves. I started to write my master thesis and i chose a data mining topic.What I have to do is to analyze the bookings of an airline company and to observe for which markets,time periods and clients the bookings can be trusted and for which not. (The bookings can anytime be canceled or modified ). I decided to use the decision trees as a classification method but I somehow wonder if clustering would have been more appropriate in this situation. When choosing between decision trees and clustering, remember that decision trees are themselves a clustering method. The leaves of a decision tree contain clusters of records that are similar to one another and dissimilar from records in other leaves. The difference between the clusters found with a decision tree and the clusters found using other methods such as K-means, agglomerative algorithms, or self-organizing maps is that decision trees are directed while the other techniques I mentioned are undirected. Decision trees are appropriate when there is a target variable for which all records in a cluster should have a similar value. Records in a cluster will also be similar in other ways since they are all described by the same set of rules, but the target variable drives the process. People often use undirected clustering techniques when a directed technique would be more appropriate. In your case, I think you made the correct choice because you can easily come up with a target variable such as the percentage cancelations, alterations and no-shows in a market. You can make a model set that has one row per market. One column, the target, will be the percentage of reservations that get changed or cancelled. The other columns will contain everything you know about the market--number of flights, number of connections, ratio of business to leasure travelers, number of carriers, ratio of transit passengers to origin or destination passengers, percentage of same day bookings, same week bookings, same month bookings, and whatever else comes to mind. A decision tree will produce some leaves with trustworthy bookings and some with untrustworthy bookings and the paths from the root to these leaves will be descriptions of the clusters.